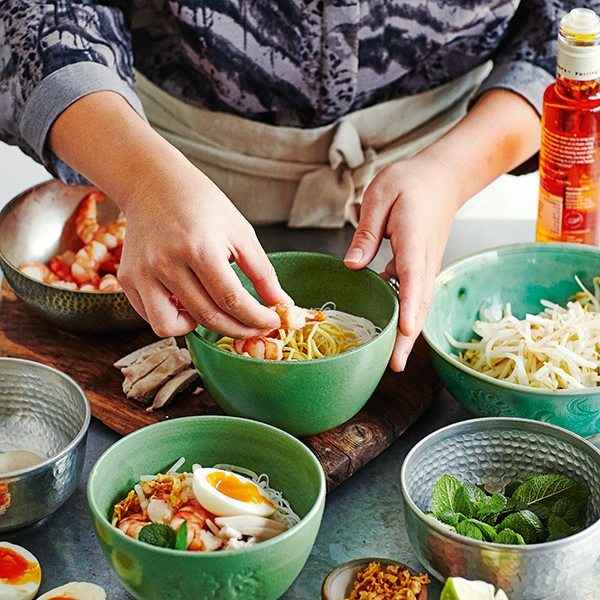 Make Ping Coombes’ showstopping laksa dish from the MasterChef quarter finals 2014, with this step-by-step guide. This recipe serves 4. Hands-on time 30 min, simmering time 25 min, plus soaking. Poach the chicken/prawns and make the laksa broth (step 4) up to 2 days ahead, then cover and chill. 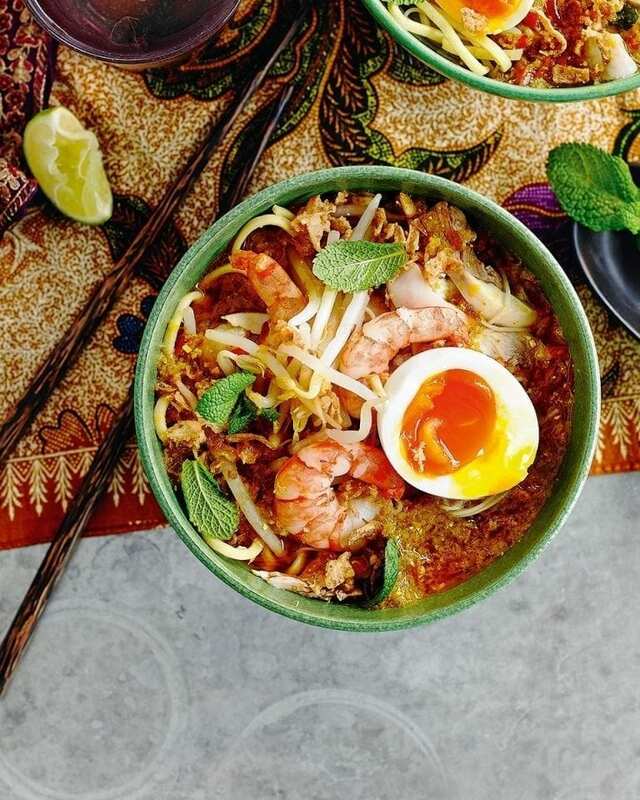 Make double the quantity of laksa paste and store in the fridge for up to 1 month. Visit orientalmart.co.uk, souschef.co.uk and asiancookshop.co.uk for harder-to-find ingredients such as bean curd puffs (also called tofu puffs). Or go to an Asian supermarket, if you can, for ingredients to make your laksa taste even more authentic. If you can’t find dried shrimps, you can season the laksa paste with fish sauce. Add 2-4 tbsp depending on how intense you like it. Deseed the fresh chillies before chopping them, if you want to reduce the spice – or omit half. If you like spice, leave some broth unstrained (step 5) to retain more chilli heat. In place of fresh galangal, use more ginger – or buy galangal paste in a jar or tube (from the spice section of large supermarkets). You can buy shrimp paste in larger supermarkets (we used Seasoned Pioneers from amazon.co.uk). If you have trouble whizzing the ingredients (step 2), add a little more vegetable oil to loosen the mixture. Don’t add water as you don’t want a watery paste when it hits the frying pan. Cook the laksa paste for at least 15 minutes. If you have time, cook it very gently for 30 minutes or more – the flavour will deepen. 1. 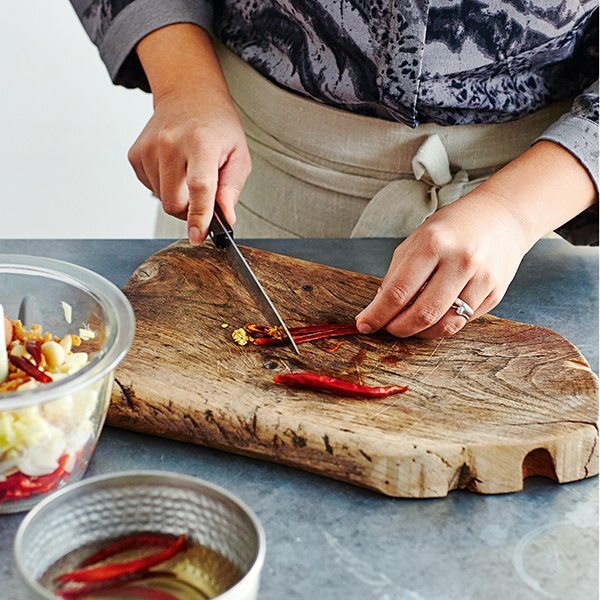 For the laksa paste put the dried chillies in a small pan, cover with water, bring to the boil and cook for 5 minutes on a medium heat, then remove from the heat and leave to soak for 10 minutes (no need to soak chilli flakes – add them in step 2). Drain, halve the chillies and deseed. Put the dried shrimps in a bowl and cover with just-boiled water. Leave for 5 minutes, then drain. 2. Whizz the soaked chillies and shrimps in a food processor with the other laksa paste ingredients to make a rough paste. 3. Heat the 100ml vegetable oil in a wok or heavy based frying/sauté pan over a medium heat. 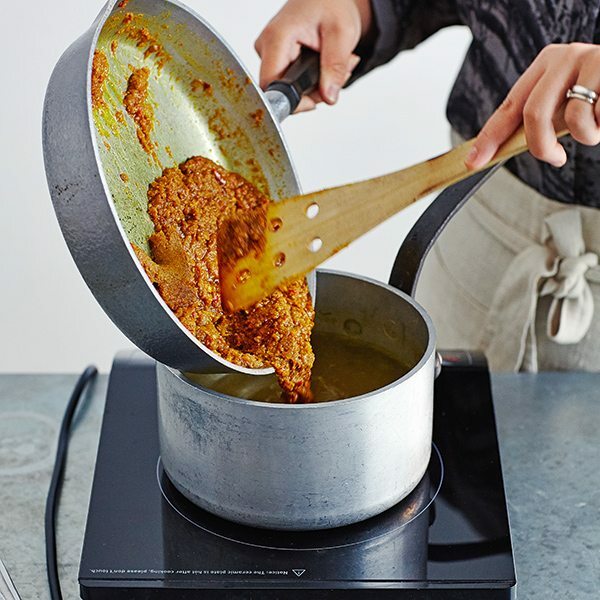 Add the laksa paste and fry on a low heat for at least 15 minutes, stirring from time to time. When the mixture darkens slightly and oil appears at the bottom of the pan after you push a spatula through it, the paste is ready. 4. 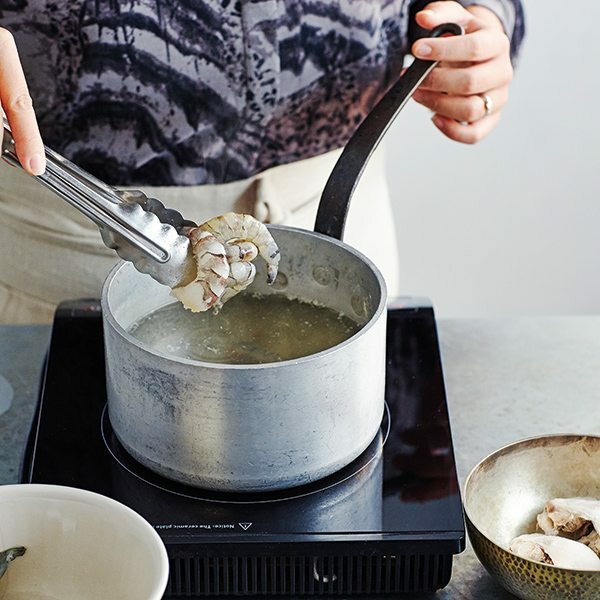 Put the chicken in a pan with 350ml cold water, the lemongrass and salt, then poach over a gentle heat for 15-20 minutes until cooked through. Use a slotted spoon to remove the chicken from the pan and set aside on a plate to cool, then cut into strips. Add the raw prawns to the poaching liquid and cook for 2-3 minutes until pink and opaque. Use a slotted spoon to transfer to the plate with the chicken. Skim off any scum from the surface of the poaching liquid and discard the lemongrass; top up with water to make 1.2 litres. 5. Put the poaching water in a large pan and add the cooked laksa paste, chicken stock cube and coconut milk. Bring to the boil over a medium-high heat, add the bean curd puffs (if using) and simmer for 5 minutes. Season if necessary. 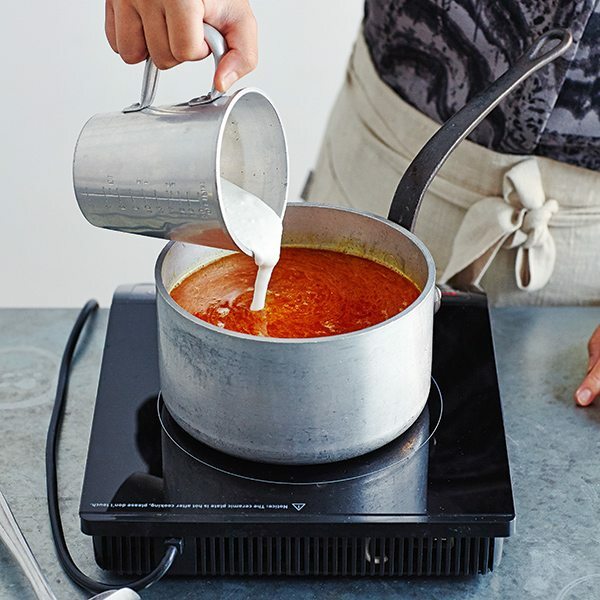 Strain the laksa broth through a fine sieve into another pan. Remove the bean curd puffs, cut each into four pieces and set aside with the chicken and prawns. 6. When ready to serve, soak the dried vermicelli noodles and beansprouts in 2 separate bowls for 5 minutes in freshy boiled water. Scoop out with tongs or a slotted spoon and set aside in separate serving bowls, then add the fresh egg noodles to the hot water to soak for 3 minutes. Drain and set aside with the rice noodles. 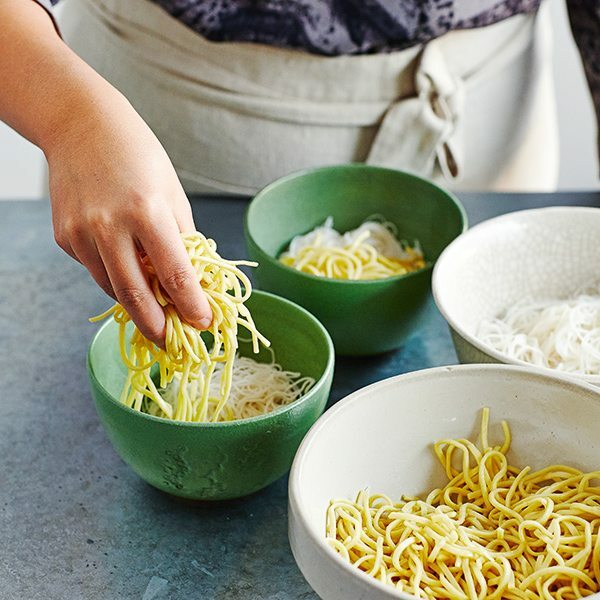 Put large handfuls of both types of noodles into 4 bowls (you might have more than you need). 7. Arrange the chicken, prawns, bean curd puffs (if using), beansprouts, a few mint leaves and ½ egg on top of each bowl of noodles. 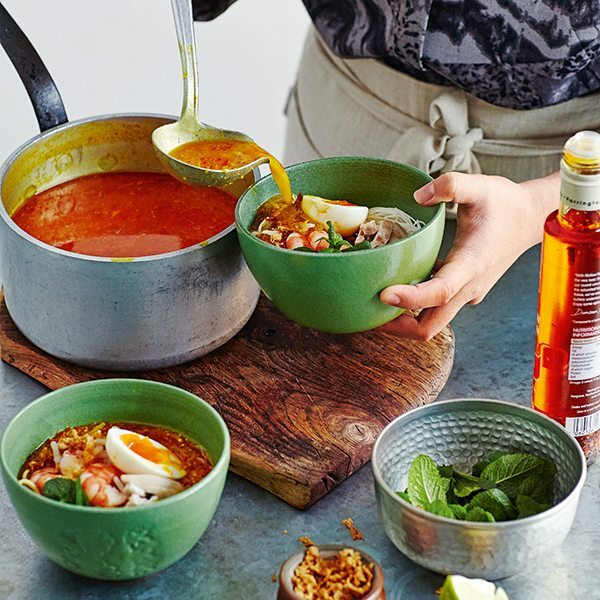 Make sure the laksa broth is piping hot (bring back to the boil if it’s not or if you’ve made it ahead), then ladle the hot broth over the noodles. Serve the laksa with wedges of lime for squeezing over. Sprinkle with a few drops of chilli oil with shrimp (if using) and a scattering of crispy shallots/onions.